The coming of age of millennials and Gen Z is redefining the design of multifamily housing and apartment buildings. These generations are seeking living environments that address their values and lifestyle preferences such as co-living arrangements, emphasis on social space, rise of the sharing economy, and the prioritization of convenience. This also represents a sizable opportunity in the market as the spending power of these generations’ increases. Developers need to understand these requirements so they can design housing that speaks to these priorities. Highlighted below are five apartment building design trends you can’t afford to ignore. Co-living and co-working are no longer just for the “digital nomads” as more people start to appreciate the communal and entrepreneurial spirit of the concept. Co-living communities are popping up in large cities like New York, San Francisco, and London (and even Syracuse). Co-living startups such as WeLive, Roam, Pure House, and The Collective are leading the way for this lifestyle. Co-living spaces cater to professionals who not only want a roof over their heads but also a place to network and work. These spaces address the need for flexibility and the amenities to support their lifestyle choices. Since 88% of millennials live with roommates, the notion of getting more out of their living arrangement seems to be a logical next step. Millennials are willing to live in compact apartments in exchange for access to more common areas and better amenities. In addition, they’re socially-conscious and health-conscious. They look for inclusive living environments and amenities designed to support these values so they can meet like-minded people while leading a healthy lifestyle. 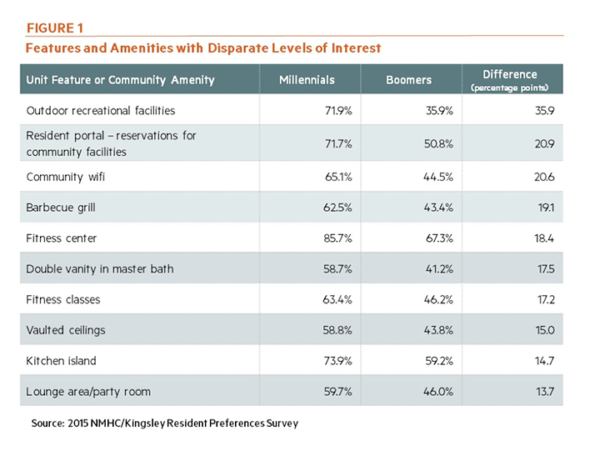 According to a study by the National Multifamily Housing Council, the millennial generation values fitness centers, outdoor recreational facilities, and barbecue grill areas when seeking housing. In addition, they also want to integrate a unique experience into their living arrangements. For example, having spaces that allow them to organize activities such as yoga or cooking classes. Creating common spaces or including shared amenities doesn’t mean you’re building a dorm for a bunch of college kids. As millennials are beginning to form families, they seek living spaces larger than the studios or one-bedroom apartments that many of them currently occupy. A study by Gallup Analytics has found that 39% of millennials have children under the age of 18. However, less than 40% of new apartment development falls into the two-bedroom or more category. There’s a demand in the marketplace for larger apartments to support these families. In addition, amenities such as a children’s playroom or even a daycare center are going to add value to a property targeted at this demographic; while apartment buildings located in sought-after school districts will be in high demand. Millennials grew up with technology which they expect to be part of their daily living environment and arrangements. They demand a seamless online and offline integrated living experience. For example at Fayette Place, an apartment building in Syracuse, NY built by VIP Structures, residents are given a key fob for building entry that also allows them to buzz in guests through their cell phone. Besides the ability to “plug-and-play” when it comes to common amenities such as accessing Wi-Fi or renting a conference room with just a few clicks of the mouse, residents also want to be able to handle their relationships with the property management company digitally. Many prefer to pay rent online or use a residents’ portal to reserve amenities such as a yoga room or meeting facility. The new generations are less focused on conspicuous consumption but that doesn’t mean they don’t want to be pampered. Millennials are looking for luxury in the form of experiences, services, and conveniences such as security guards, concierge services, in-suite washer/dryers, and dishwashers. They value features or amenities such as smart controls for HVAC systems, dog parks, pet washing stations, recycling services, e-commerce delivery rooms/lockers, and electric car charging stations. Not to mention, they’re willing to pay a premium for prime location so they can be a stone’s-throw away from premium stores, parks, schools, hiking/biking trails, and more. Technologies and psychographic trends are shifting multifamily and apartment housing. Many people are willing to pay a premium for convenience, community, and flexibility. We aren’t just constructing buildings or designing spaces anymore. We’re creating a living experience that reflects the residents’ value, preferences, and lifestyle choices. This makes collecting resident feedback increasingly important for property managers. To learn more, check out our blog on how to collect resident feedback and why it’s important. VIP Structures is an integrated design-build firm in Syracuse, NY. Our architecture, engineering, construction and development disciplines help organizations with their design and space needs all across Upstate New York.